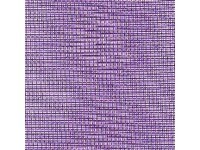 Home :: Bag Mesh - FREE POST AU :: Pre-cut Purple Pet - Bag Mesh 45cm x 92 cm - 18" x 36"
One piece of pre-cut purple pet - bag mesh. 45cm x 92 cm -18" wide x 36" long. This is plastic, vinyl very small mesh used for making the mesh bags that are taking the country by storm.